The Kids Service Record Booklet provides parents and children with the perfect tool for tracking the service accomplishments of young Jehovah’s Witnesses. The booklet’s 12 service-record sheets have been carefully designed with young children in mind, favoring simplicity and encouraging children to track their service activities on their own. 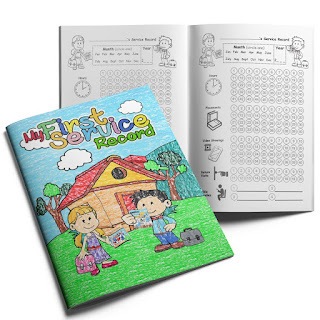 The booklet further encourages child engagement through a number of coloring opportunities that help to keep track of service reports from the field. Similarly, a collection of illustrations helps children understand what aspect of service is being tracked, from video demonstrations to return visits. The Kids Service Record Booklet is a perfect fit for children who enjoy reading and engaging with other service-based products from Ministry Ideaz, such as My Bible Story Puzzle Book or the Fun Kids Bible Activity Workbook. For the last 15 years, Ministry Ideaz has provided Jehovah’s Witnesses around the world with a variety of handcrafted ministry items. Ministry Ideaz develops a range of spiritually focused products, some geared toward younger children.